Thus the well-known term 'Malaysian Time' which is +1/+2 hours from the predetermined meeting time. How late will the person be? I don't mind that people are late. We are all human & sometimes we cant help it. But I cannot accept someone giving you the idea that he/she will be there soon when that someone knows that he/she will not be able to honour the agreed meeting time for a long duration. Even 30 mins qualifies as a long duration. 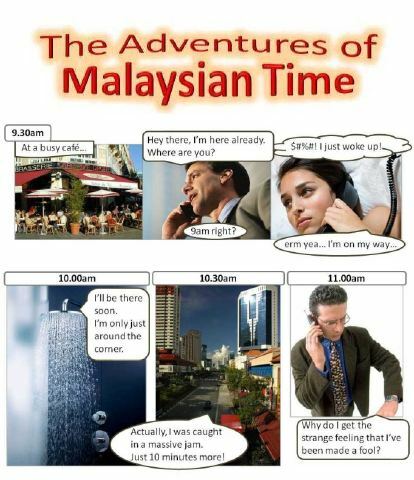 Besides appointments, some Malaysians also lie about being late when it comes to deadlines. Even an office where you would expect efficiency & accountability can make you wait week after week with great expectations for more than a month. All I need is a realistic assessment of the duration that I will have to wait. Be it 2 hours or 1 month, I would appreciate an honest approximation. With this knowledge of truth, I can find some other ways to entertain myself so that my wait would not be as long & torturous. I will also be less offended by your lateness too. Be it Malaysian or not.